What is not great about warmer temps and longer days to work outdoors in? In a word MUD! 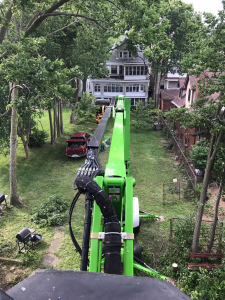 Before our latest “tool” find (Lucy , the lift) getting a bucket truck in and off your property without leaving deep ruts or getting stuck, meant waiting or a lot of extra work; expense or magic tricks. Meet Lucy – we love her, so do our neighbors in Sun Prairie, DeForest, Oregon and Madison Wisconsin. You will too. Lucy can get in tight spots and reach heights of 70 ft high and 400 ft wide safely and lots faster than this climbing arborist. To make the most of Lucy and your wallet Autumn Tree Service now offers we drop you clean up options for our Do It Yourself neighbors. Or hire us and your own ground crew! and let us know what you need. Thanks for the opportunity. Lets get er done! For Faster Response you can always call!